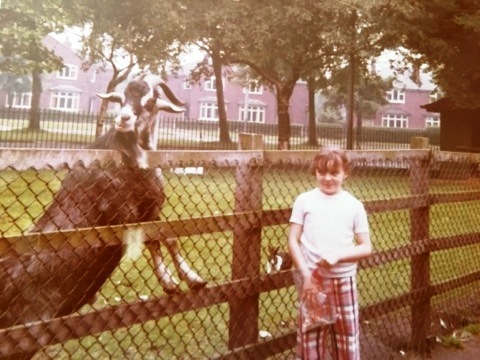 Now I don’t remember the goats in Chorlton Park but Julie does and here on the Mauldeth Road West side of the park is the said goat. The park dates from the late 1920s and over the years has had many attractions from that pool, to the bowling green and the interesting little nature reserve by the Brook. I am pretty confident that Julie’s picture will bring a flood of memories and comments and I hope some more pictures. I remember them, there were rabbits and guinea pigs and sheep too. There was a cow that had a calf as we were doing our exams in the hall at Wilbraham High. It mooed all afternoon. Yep, there were definitely wallabies, and rabbits - OUR rabbits, an unusual gingerish one and a grey one, when they burrowed out of their pen and some kind soul thought the park would be a suitable new home. Unfortunately, someone burnt the hut down and that put an end to it.